Situated on Ireland’s Ancient East the Estate is also home to Ireland’s premier Spa Resort and Leisure Club with a 20-metre pool and state of the art Gym Facility. The award-winning Spa Resort has 18 treatment rooms with a myriad of treatments that complement any stay. Come and discover the enchantment of The Johnstown Estate with magical happenings and new discoveries around every corner. They have had some very special guests checked-in to the hotel recently and are now living in the enchanted woodland. The fairies do welcome visitors into the woodland but they can be shy and may not appear by themselves. However, sometimes you may catch a glimpse of them as they go about their day so keep your eyes peeled to catch a glimpse of the magic. Treat you and your family to a magical midterm break with a two-night stay and full Irish breakfast at The Johnstown Estate. Choose from their elegant spacious family rooms or a luxury self-catering lodge located on the Estate grounds. Enjoy a delicious two-course dinner with coffee on an evening of your choice in the relaxed surrounds of The Coach House Bar. Children under 12 years can eat for free from the kids’ menu. – Two nights’ accommodation in a family room or lodge. – Two-course dinner with coffee on one evening in The Coach House Bar. – Children under 12 eat free from the kids’ menu. – Complimentary access to The Leisure Club. – Complimentary Wi-Fi & parking. 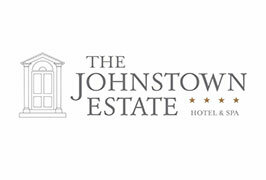 Find out all about The Johnstown Estate Family Packages and Special Offers. Luxurious family rooms at the Johnstown Estate offer all the essential comforts of a 4-star property, with enough luxurious detail to ensure a most memorable holiday for all. Suitable for 2 adults sharing with 2 children under 12 years of age. With packages to suit all needs, Johnstown Estate strive to ensure that the hotel creates the perfect atmosphere for that relaxing family fun break – with their special offers there is always a reason to stay. Alongside the generously proportioned ensuite family bedrooms, there is a state of the art 30,000 square foot Leisure Centre and Spa with a 20-metre swimming pool and kids’ pool. Another family-friendly option at The Johnstown Estate is our self-catering lodges. Relax on the patio while the kids meet new friends, cycle around the common green area or play on the custom-built climbing frame. Each lodge consists of 1000 sq of luxury self-catering accommodation over two floors. Located directly adjacent to the hotel, you will never be far from the facilities on offer. The Lodges are ideal for long or short stays and family breaks. 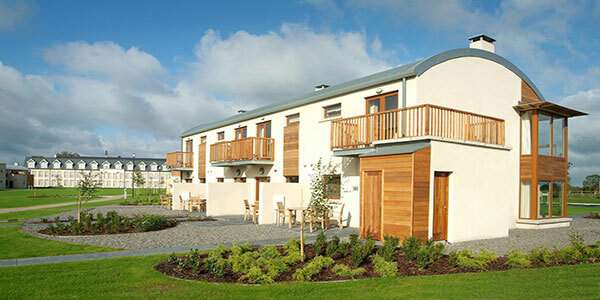 Each luxury self-catering lodge is designed to a very high specification for up to four people. Guests can enjoy a home away from home, terrace for those sunny evenings, private parking at each lodge and full use of all the facilities of the hotel. These include the exclusive leisure centre, spa and the wide range of dining options to choose from. Guests staying at The Johnstown Estate have a variety of dining options to choose from during their stay at the luxurious 4 Star Hotel. From their new steak restaurant Fire & Salt, where the team of dedicated chefs are on hand to create a dining experience using the finest, fresh locally grown produce, premium quality, organic and free-range meats and the freshest seafood from the Island of Ireland. Breakfast is served daily using only the finest quality ingredients, from free range eggs from Louth, quality bacon from Kilkenny, our famous family breakfast sausages from Granby’s in Dublin, to our own homemade quality jams, curds and spreads. For a more leisurely bite, The Coach House Bar, where theteam will more than gladly help in delivering quality food and drink, where the same standards apply – using locally sourced foods, cooked to perfection and delivered with a simple smile. 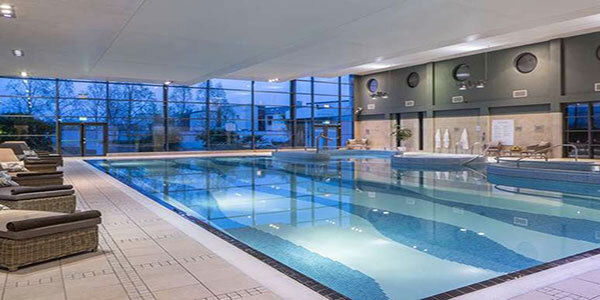 The Johnstown Estate offers a state of the art 30,000 square foot Leisure Centre and Spa, with a 20-metre swimming pool, kids’ pool, jacuzz,Canadian hot tub and state of the art Gym Facility.